Kitchen Remodeling does not have to be chore! A home renovation project can be a creative way to add personal touches to the most frequently used room of your house! 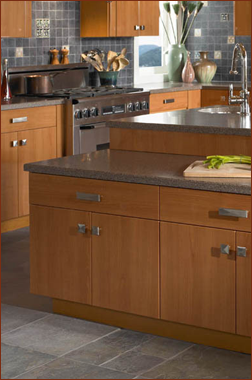 With so many different styles of cabinets, countertops, appliances, fixtures, hardware and accessories, Kitchens by Hastings is sure to have the materials to suite your needs and taste. Are you dreaming of an eat-in kitchen with rustic, country flair? Or do you prefer a sleek, modern, urban inspired look? Even if your style is more “easy open” than gourmet, freshening up your existing cabinets will breathe new life into your home. Kitchen Remodeling is a sure investment to increase your home’s value. We can help you create a unique and functional space that your family will enjoy for years to come. Perhaps your kitchen remodeling project requires natural granite or exotic stone counters. Maybe slate, formica, corian or laminates are more to your liking. Would an artisanal faucet compliment that brand new backsplash or is classic form and function what you are looking for in a sink? If you have lots of ideas about creating your dream kitchen, but are unsure if you want to commit, our 3d Design System allows you to view what your kitchen will look like after it is finished. This is a great way to compare and alter designs, highlight and change stylized elements and offer feedback in real time thus assuring your satisfaction with the final product. When your kitchen needs a make-over, the details make all the difference. Our company takes pride in its reputation for quality, craftsmanship, and custom design… without the designer price tag. From cabinets to countertops, Kitchens by Hastings can handle everything you need to express your own personal style at a reasonable price… including the kitchen sink (and the faucet and fixtures)! Kitchens by Hastings services Boston and the North Shore including, Winthrop, Danvers, Salem, Beverly, Stoneham, Saugus, Malden, Peabody, Reading, North Reading, Lynn, Middleton.